This was my finalist entry in the competition and it won. I'd love to go into great detail about how they called my name and I wasn't expecting it but let's just skip all that and say I WON and I'M THRILLED. There is so much more that happened. I had a consult with an Industry Person who gave me a lot of good advice, feedback, encouragement, and some "get out of your own way," and I know some stuff that I didn't know. 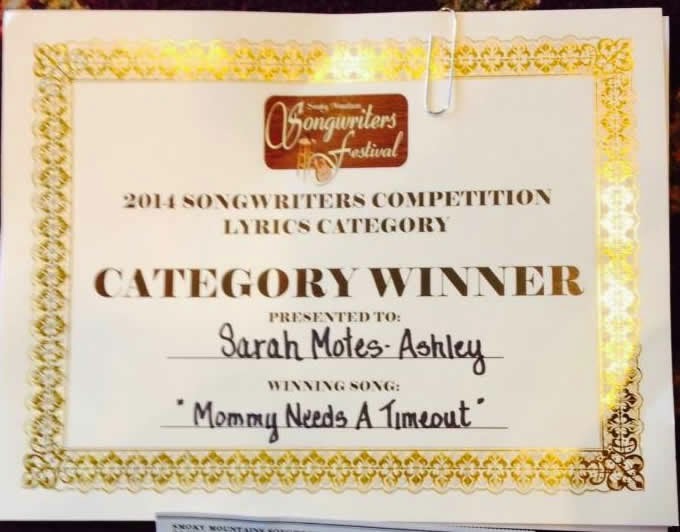 About licensing my songs to those who want to record them, and about how to make my songs "better" according to Nashville Rules for Commercial Success, so that this year's Honorable Mentions turn into next year's winners. Winners ! Win! Competition! Yes, as you can tell right now I'm very pro-contest since it's a thrill. I keep telling myself that song competitions are a cheap high and can be a debilitating low, and are song contests really keeping my eye on the ball? But then I think, which ball? Because there are quite a few and they are bouncing all over the place. The best area of the weekend was the people. The Industry Person was someone I am pleased to know better, not because she can help me, but because she is an interesting and likeable human who is honest about her baggage and her joys. My dear friend and singing friend Margaret was my rock, my chauffeur, the other half of my harmonies, and a big chunk of my singing history. And I have solidified my friendship and soon-to-be working relationship with a young, beautiful, abundantly gifted singer and her family. More about that later. Oh and the guitar thing. I keep having guitar debuts and then deciding that they were so tragic they didn't count. Friday morning, under the "Be Authentic" sign, boy was I. Nervous, skipping chords, fumbling, playing too fast. While performing I concocted the narrative of the awful guitar player who made everyone uncomfortable, and humiliated herself, but with Margaret's help I decided it wasn't quite that bad. But then Saturday I played with Margaret and my young friend Emily, and it was gorgeous with the mountains and an actual cool breeze and I actually kept my head and my tempos, and my playing was as good as it can be right now. Not very impressive but mostly solid. I am really glad about that. I am the luckiest and most blessed woman, and I don't deserve most of the good things that happened to me this weekend.